Sliding Systems manufactures the only all-aluminum curtain side trailer in North America. Constructed of high grade aluminum extrusions, Sliding Systems engineering and technical expertise provides you with the strongest, lightest weight curtain side trailers on the market today. 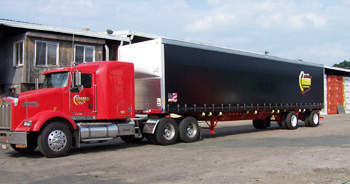 Curtain side trailers save time in loading and unloading your products, helping decrease your overall operating expense. An example would be the logistics of loading long and bulky freight in a traditional semi-truck trailer versus loading a side opening curtain side trailer, which would result in savings of both time and money. Improve your investment return with the easy side loading capabilities of Sliding Systems curtain side technology. Our customers tell us there is a fast payback for the additional cost of the Curtainside. The engineering and technical changes are constant, to make them more durable and easier to use. Over 85% of the trailers and vans in Europe are Curtainsides, because fuel is expensive and they need the flexibility. SSI offers the latest technology and is constantly working with Europe to bring the highest quality products to North America. When you consider how much your company spends on packaging your products for shipment, plus the added cost for the customer who has to dispose of this packaging, you can quickly understand the savings offered by the use of our Curtainside trailer technology. With careful planning, we can help a shipper save their customer money by re-designing the pallets or racks to make it possible to haul more products with less disposable materials. Many transportation companies now use bins that are reusable. Others charge for custom pallets and refund on return, so there is no waste. As the cost of trailer equipment has increased, most trailers have been re-designed to offer lower overall weight. Lighter materials, while more expensive, allow bigger payloads. Logistics companies today in order to be flexible, have been tarping their pay loads, sometimes several times each day on a diminishing load. The Curtainside allows the company to load the trailer in a manner that will give that driver the most flexibility for unloading. Trucking companies today who have a defined series of one-way trips can now offer a more versatile opportunity for better back hauls. Many companies that own SSI Curtainsides have found them to be very beneficial. There's no need for loading docks, saving you on wait time. Tarps are eliminated, thus reducing work injuries and gaining more valuable time. Loads are protected from the weather. Sliding Systems Curtainside technology is designed for user-friendly operation. The curtains can open and close the entire length of a trailer within minutes. Let us help you put Sliding Systems curtain side technology to use in your trucking company today! In 1991, a small company started in Haslett Michigan as a "subsidiary" of a larger Curtainside Manufacturer from the southern part of the United States. Growth and expansion dictated that the founders of the "baby" company in Haslett, Michigan, needed to detach from the parent and grow on it's own. The companies parted and Sliding Systems, Inc. was born and set out to grow in the Midwest market. 1992 saw changes and growth in Sliding Systems in two pole barns on Coleman Road in Haslett. The owner of Sliding Systems, Inc. was really a trucking man at heart and not a manufacturer. This "trucker man" befriended a trio of investors for expansion capital and a partnership was formed to facilitate the expansion of Sliding Systems capabilities. The trucking man and his friend (one of the trio), soon concentrated their efforts on a trucking company they were involved in and became a primary customer of curtainside trailers manufactured by Sliding Systems, Inc. 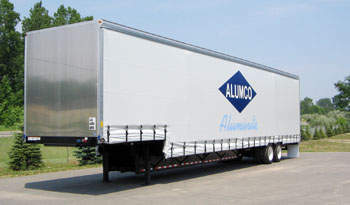 In 1998 the vision of an ALL ALUMINUM Curtainside came to reality with the introduction of the first and still the only All Aluminum Curtainside manufactured in the world. This product is unique in that it incorporates all the lightweight features of Aluminum with the strength and durability of other units. Aluminum is strong, light weight, does not rust, and presented a superior appearance to the market. With this aluminum unit, Sliding Systems, Inc. had a major step up on it's competitors. Interests separated between the trucking pair and the current owners who wanted to concentrate on expanding the manufacturing capabilities. The partnership between the investors and the original owner of Sliding Systems, Inc, was dissolved by mutual agreement in the year 2000. The two "truckers" went on their way in the transportation end of business, and the current Owners, Duane Swenson and Gail Dallmann Swenson, took over 100% ownership of Sliding Systems, Inc. The All Aluminum Curtainside took off in the market place and Sliding Systems experienced a wonderful growth pattern and expansion phase. Expansion is a wonderful thing in a business although it presented a difficulty for the company. The existing "pole barns" were too small to accept any more growth. Something had to be done if the company were to grow and expand. In July of 2004 with a great deal of fanfare, ground was broken to construct a state of the art production facility for curtainside trailer manufacturing in Haslett, Michigan on what was once the "out back parking lot" next to Sliding Systems facility. On December 26, 2004, everyone on all shifts of Sliding systems was moving the final items into the new building. 36,400 square feet of state of the art building was ready to go and the goal of moving in before the end of the year was met with several days to spare. Sliding Systems, Inc. was now capable of expanding as never before. Sales were stimulated in the growing economy by the increased capacity. A second shift was added to facilitate "roll through" curtain repairs after 5:00 PM to make utilization of equipment better for our customers. Markets were expanded and the aluminum curtainside with the weight advantage soon brought increased orders. Today, Sliding Systems, Inc is the ONLY curtainside manufacturer in the world to have a DOT Certified and tested Front Bulkhead. We make the finest unit available in the North American market, and look forward to continued growth and product development and improvement.